Croatia is globally popular because of its breathtaking indented coast and clear blue Adriatic sea. Of numerous coastal rivieras, this time we've chosen the Omiš riviera - one of the most beautiful rivieras on the Croatian coastline. It stretches over 20 kilometers and encompasses many small fishing villages each of which has a few beaches and coves. Whether the beaches are pebbly, sandy or rocky, they will be liked by families with children, adventerous and even romantic couples in search of a lonely spot. 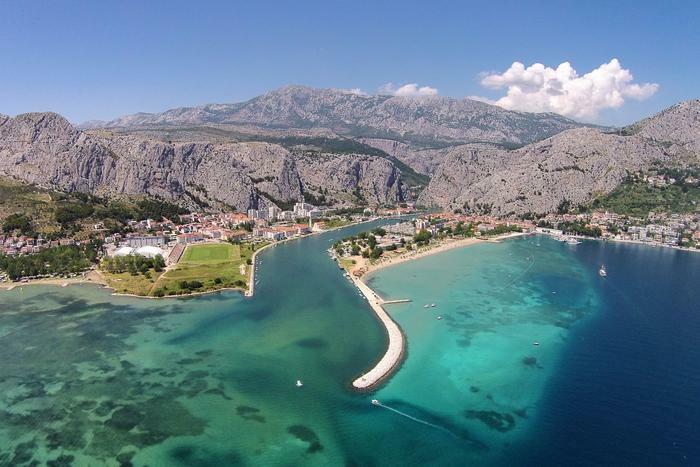 Book an accommodation in Omiš or nearby places like Duće, Nemira, Lokva Rogoznica or Mimice, and prepare yourself for enjoyment on beaches of the Omiš riviera. There are two pebble beaches in the little settlement of Nemira which is only 3 km away from Omiš. Surrounded by thick pine wood which gives a big shade, and placed below the local highway – away from car traffic, the beaches of Nemira are a real treat to families with children. Although away from the hustle and bustle of city life, you can still find coffee shops, a shop and a restaurant. A 6 kilometer long sequence of sandy beaches makes Duće one of the most popular destinations for bathing, especially for families with children. Duće are also special because the houses, apartments, caffees and restaurants are placed just by the shore. So, when you're not having a swim, treat yourself with dalmatian specialties or just sip your favorite drink, listen to the song of cicadas and enjoy the beautiful sea view. Located halfway from Omiš and Brela, Lokva Rogoznica is full of tidy pebble and a few sand beaches. In this little and peaceful settlement you can find basic contents for your everyday needs – a shop, restaurant and a post office. This little tourist settlement hides within itself many interesting facts. Other than being an attractive spot for yachtsmen, Ruskamen also has one of the oldest nudist beaches on the Adriatic. There's also a diving center that organizes visits to the amphora site in Mala Luka and Vruja – one of the most beautiful diving locations in all of Europe. Adventurers can rent out a boat or a surfing board on one of Ruskamen's pebble beaches or if you're not that adventerous just chill out in the shade of the pine trees.